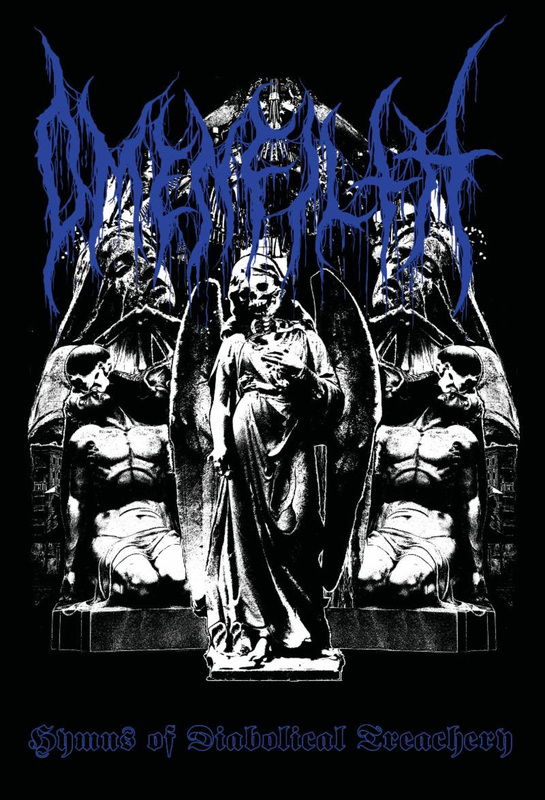 San Pablo City-based black metal legion OMENFILTH will release a limited cassette edition of their Hymns Of Diabolical Treachery full-length next month via Eternal Death Records. Featuring members of long-running death metal behemoths Pathogen, OMENFILTH was spawned from the abyssal crypts of the Philippines and spews forth vehement black metal terror reminiscent of early Rotting Christ, Varathron, Necromantia, and Samael. In celebration of Hymns Of Diabolical Treachery's cassette debut, Decibel Magazine today offers up "Under The Scythe Of The Infidel" for public feasting. "The song was written around August of 2016," says OMENFILTH guitarist/vocalist Willie Desamero. "I was listening a lot at that time to Necrophobic's The Nocturnal Silence album and I thought of writing something along the same lines but try to make a couple of the verses sound like '80s thrash, such as Sodom or Iron Angel. Regarding the lyrics, it is about anti-religious extremism/terrorism and about 'infidels' having victory over people pushing that agenda." Hear "Under The Scythe Of The Infidel," courtesy of Decibel, at THIS LOCATION. Self-produced and initially released on CD via Nero One Records, OMENFILTH's Hymns Of Diabolical Treachery showcases the band's curious duality with Side A highlighting their classic, maniacal nastiness and Side B offering up one twenty-plus minute track of haunting ambience. Hymns Of Diabolical Treachery will be released on cassette and digital formats via Eternal Death Records on July 27th. Preorders are currently available at THIS LOCATION where "Demogorgon" can also be streamed. OMENFILTH stands apart from the throngs of bestial black/death metal clones choosing instead to take a path less traveled, harnessing the external darkness of the world and the internal feelings of misanthropy, apathy, desolation, and the urge for heretical wisdom and occultic esoterica, and fusing it all to create blackened death/thrash of the highest quality.